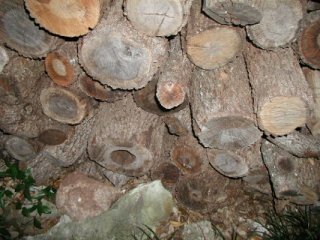 Fuel wood is wood and wood products, possibly including coppices, scrubs, branches, etc., bought or gathered, and used by direct combustion. The charcoal burns, forming carbon dioxide either directly or with an intermediate conversion to carbon monoxide. One pound of very dry wood of any species has a calorific value of approximately 8,600 Btu. Any moisture in the wood cuts down the recoverable heat by carrying heat up the chimney during vaporization. Additional heat is lost through volatile liquids and gases that form during combustion, but these vary by the type of heating unit and should be considered part of the efficiency factor of the heating unit. A pound of wood with a 20% moisture content contains 0.17 pound of water and 0.83 pound of completely dry wood and has a heat value of about 7,000 BTU. The fuel value of wood varies by the type of wood and depends on its density and moisture content. Any wood will burn, but the denser (heavier) woods, if properly dried, will deliver more Btu per cord. The advantages of drying wood to at least a 20-percent moisture level are indicated in the table below. 1 Approximate weight of standard cord, for the first two columns of figures. 2 To 20% moisture content. 3 Potential available heat from standard cord with 100% unit efficiency. Heat at 20% moisture content.